While operations and response tend to be the most profiled part of emergency management organizations, the ultimate goal is to mitigate the need for a robust and well-used operations component. Recognizing their name may betray the office's unstated goal, the DEM's Mitigation Office's primary responsibility is to provide mitigation specific information, technical assistance and funding to local governments, state agencies and the general public. The office is responsible for the administration and funding of the State Hazard Mitigation Plan which helps guide assistance to local government; the Disaster Preparedness Improvement Grant initiative to link hazard mitigation to local comprehensive planning efforts and the post-Presidential Disaster Hazard Mitigation Grant Program. The first part of this year, as you may be aware, the office is entrenched with out partners hammering out the new updates to the State Hazard Mitigation Plan. While we migrate and link info on the new Mitigation Office's home here on COEmergency, I wanted to pass along the Office's contact information and initial resource links. On this page, you will be able to find contact and program information, access the latest in DEM Mitigation News and keep up to speed with the status of hazard mitigation plans across the State. They are the backbone of all our grant administration programs and, in the most tangible and on-the-ground realized effort of our Division, are making our communities safer and more secure. Landslides are masses of rock, earth, or debris moving down a slope. They are activated by rainstorms, earthquakes, fires and by human-caused projects, such as road/building construction. Landslides can vary widely in size and can move at slow or very high speed depending on slope angle, water content, and type of earth and debris flow. Flows are generally initiated by heavy, usually sustained, periods of rainfall, but can sometimes happen as a result of shorts bursts of concentrated rainfall. Burned areas, such as from wildland fires, are also susceptible to debris flows. - Learn about the emergency response and evacuation plans for your area. Check with your local emergency manager (http://dola.colorado.gov/dem/localem.htm) for emergency information specific to your area, including local preparedness information, warning systems and sources of information in the event of a disaster. - Minimize hazards around your home by installing flexible pipe fittings, planting ground cover on slopes, building retaining walls, or channels to direct flow around buildings. - Stay alert when driving or around your house during storms. Debris-flow fatalities occer in the home when people are sleeping during storms and on the roadways when fast moving material impacts the road. When driving, remember to look around and up when in mountain areas. - Listen for any unusual sounds that might indicate moving debris, such as trees cracking or boulders knocking together. A trickle flow may precede the much larger event and many slides can onset rapidly. - If you are near a stream or channel, be alert for sudden changes in water levels or if the water changes from clear to muddy. Such changes indicate activity upstream and you should be prepared to move quickly. - Be especially alert when driving. Bridges may be washed out, culverts overtopped and boulders may be dislodged. Embankments upon roadsides and the base of high-angle, steep terrain are particularly susceptible to landslides and rockslides. - Contact your local fire, police or public works department immediately if you suspect or have witnessed a landslide. - Inform affected neighbors. You neighbors, and particularly visitors to Colorado unfamiliar with mountain terrain, my not be aware of potential hazards. Advising them of the threat may help save their lives. - If in landslide/rockslide with no option to evacuate, curl in to a tight ball and protect your head. - Stay away from the slide area. There may be danger of additional slides. - Check for injured and trapped persons near the slide, without entering the slide area. Stay on-site to direct rescuers to their locations. - Help anyone who may require special assistance. Elderly, families with young children and people with disabilities my benefit from the additional help. - Look for and report any broken utility lines and damaged roadways and railways to appropriate authorities. Reporting potential hazards will help direct efforts to mitigate any additional hazards and injury. - Check building foundations, chimneys, and surrounding land for damage. - Replant damaged ground as soon as possible since erosion caused by loss of ground cover can lead to additional flooding, landslides/rockslides. - Seek advice from experts to evaluate remaining or existing hazards or to design corrective techniques to reduce risk. Contact local emergency management officials, the the Colorado Geological Survey (http://geosurvey.state.co.us/) or the Colorado Department of Natural Resources (http://dnr.state.co.us/) for more. The Division's Cindy Vonfeldt and Elizabeth Ownsby, along with Art Pope of Pueblo County Sheriff's Office Emergency Services Bureau, David Ouimet of the Federal Emergency Management Agency Region VIII Chemical Stockpile Emergency Preparedness Program Office, Matthew Mueller from Denver Office of Emergency Management, Tim Klippert from the Medical Center of the Rockies and Pat Mialy from the City of Loveland Office of Emergency Management are the State and our Colorado-based partners latest Master Exercise Practitioner Program (MEPP) graduates. This represents the single largest advance in our resident exercise capability in the last 5 years. This team produced one of the finest exercise documents recently developed and will be field tested it later this year in Pueblo. Congratulations to each of them. Completing the prerequisites for MEPP admission are impressive in their own right. They represents a commitment in both time and energy reflective of the serious nature of the program. Once met, candidates are eligible to compete with all 57 states and territories for a coveted seat in one of three or four annual presentations. Other hurdles to entry include the full support of the candidate's home agency. This support begins with a challenging opening essay and required letter of introduction and endorsement from the candidate's superiors. With that and a bit of luck, the candidate will be sorted, ranked and - hopefully - granted of the 50 or 60 individuals per cycle selected to attend this three week gorge of information and activities. Normally spread over a 6 month timeline, the course load and work allows ample time for students to reflect on what, exactly, they have gotten themselves into. The bulk of this time period is spent completing the required proficiency demonstrations of "PRODEM" as it is known in MEPP circles. The PRODEMs are intended, as the name suggests, to demonstrate the student's mastery of all aspects of each of the three disciplines through the submission of fully developed exercises. Not one but three individual PRODEMs are conducted, each of which are graded by the leading training and exercise subject matter experts in the country. Assessments can be brutally honest and students have been sent home, others have not graduated and more than a few have chosen not to return. The program is centered on three core disciplines: Discussion-Based Exercise Design adn Evaluation (E-132), Operations-Based Exercise Design and Evaluation (E-133) and Operations-Based Exercise Development (E-136). The program, launched in 1999 at the National Emergency Training Center (NETC) in Emmitsburg, Maryland, has produced approximately 2,000 select graduates. The next course presentation (Series #17) is scheduled at the NETC starting October 25, 2010. While that course may already be filled, FEMA Region VIII through CSEPP has a mobile training effort starting November 15 for qualified candidates. Interested candidates can find the submission standards and requirements online at http://training.fema.gov/emiweb/emiopt.asp. Applications must be routed through the State Training Coordinator, Robyn Knappe, at robyn.knappe@state.co.us. Again, we congratulate and salute the efforts of Cindy, Elizabeth, Art and David! Hail and Well Done! Some really great video of the skills of Flight For Life pilots and staff. Thanks to the Emergency Medical Services Association of Colorado (EMSAC) and their EMSAC Twitter updates for the video link referencing of a "Flight for Life helo inbound to transport an injured climber from Chasm Lake in Rocky Mountain National Park". Check out the nook they set down on at around 3:20 into the video - amazing. The next All-Hazards COML course, sponsored by the North Central Region, will be September 13-16 at the Weld County EOC training room from 8:00 – 5:00 each day. This class has expanded from three days to four due to significant changes required by FEMA Emergency Management Institute (EMI) requirements. This class is geared towards those professionals that have a responsibility for managing incident communications. Please complete the Course Nomination Form and submit it by not later than August 31st. Please contact Mark Hall at (303) 972-4902 or via email at mhall@fairmountfire.org. A public safety communications background with exposure to field operations; this experience should be validated by the authority who supervised the student. IS-700 explains the purpose, principles, key components and benefits of the National Incident Management System (NIMS). The course also contains “Planning Activity” screens, allowing participants to complete planning tasks during the course. IS-800b introduces participants to the concepts and principles of the National Response Framework. ICS-100 introduces ICS and provides the foundation for higher level ICS training. This course describes the history, features and principles, and organizational structure of ICS. It also explains the relationship between the ICS and NIMS. Course taken on line are considered an equivalent to the classroom version. ICS-200 provides training on and resources for personnel who are likely to assume a supervisory position within ICS. Classroom version preferred. ICS-300 provides training and resources for personnel who require advanced application of the Incident Command System. COLORADO SPRINGS, CO, July 19, 2010 - The U.S. Department of Homeland Security's Federal Emergency Management Agency (FEMA) and Colorado Division of Emergency Management today released $1,117,481 in Pre-Disaster Mitigation (PDM) funds to the Colorado Springs Fire Department for wildfire mitigation projects throughout Colorado Springs. PDM provides grants to state and local governments to implement long term mitigation measures. Through this Pre-Disaster Mitigation grant, FEMA will pay 75 percent of the project costs. The remaining costs will be met by neighborhood matching and Public Safety Sales Tax in the form of labor, volunteer projects and neighborhood involvement. 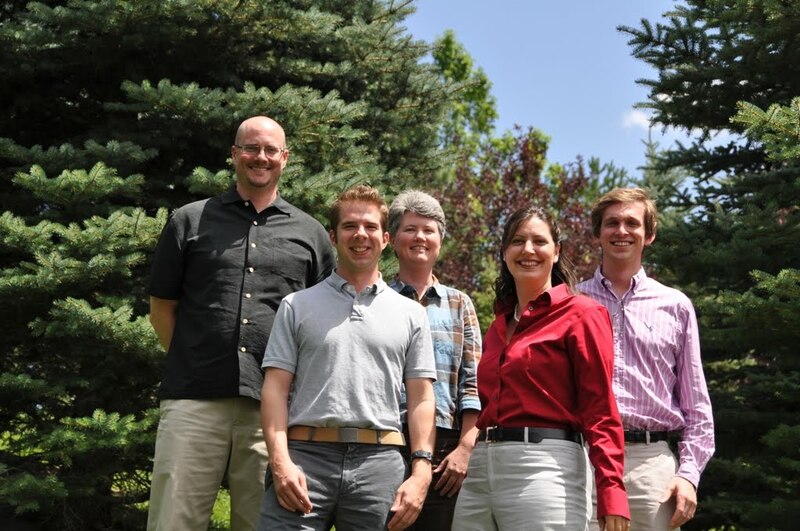 "These projects directly benefit residents and the community as a whole by reducing wildfire risk before a fire starts" said Christina Randall, Wildfire Mitigation Section Manager for the Colorado Springs Fire Department. "This additional funding will help reduce the potential for life and property loss." These funds will be used for fuels management projects in common areas and open spaces adjacent to neighborhoods identified as at-risk for wildfire. These projects will also serve as demonstration areas for homeowners who want to address mitigation on their own property. The Colorado Springs Wildfire Mitigation Section has been successful on several PDM grants over the years totaling more than $2.3 million. "We're very fortunate that funding has become available to assist our community in addressing wildfire risk" said Brett Lacey, Colorado Springs Fire Marshal. "These projects will do a lot to reduce fire behavior in a wildfire event." 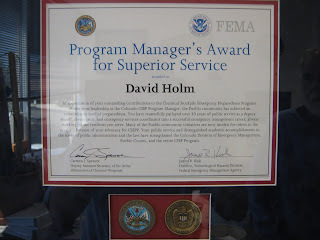 DEM's David Holm receives U.S. Army/FEMA Award for "Superior Service"
Just an opportunity to brag on one of our own.... David Holm. David is our Senior Adviser to DEM and is a walking encyclopedia of our Division's history, incidents, and emergency management in general. If you an emergency manager, you might have even read one of his recent publications in the International Association of Emergency Managers Bulletin regarding Emergency Management Standards. David is an all-around cool and smart guy. It isn't just us that thinks this, either. Recently, David was awarded the Program Manager's Award for Superior Service by Carmen J. Spencer, Deputy Assistant Secretary of the Army for Elimination of Chemical Weapons and James R. Kish, Director, Technical Hazards Division of the Federal Emergency Management Agency. The award reads: "In appreciation of your outstanding contributions to the Chemical Stockpile Emergency Preparedness Program. Under your leadership as the Colorado CSEP Program Manager, the Pueblo community has achieved an extraordinary level of preparedness. You have masterfully parlayed over 30 years of public service as a deputy sheriff, investigator, and emergency services coordinator into a successful emergency management career, always working for the residents you serve. Many of the Pueblo community initiatives are now models for others in the program because of your advocacy for CSEPP. Your public service and distinguished academic accomplishments in the study of public administration and the law have strengthened the Colorado Division of Emergency Management, Pueblo County, and the entire CSEP Program." We agree, Dave. Congratulations and "Thanks." On Friday, October 8, 2010, the Colorado Avalanche Information Center (CAIC) will host the 9th Annual Colorado Snow and Avalanche Workshop at the National Mining Museum in historic Leadville, CO.
Pre-registration is encouraged and will be through the CAIC website beginning in September. The CAIC staff are still finalizing the schedule, but anticipate workshops until 4:30 pm with a social event to follow. Updates will be posted on their website. At this time, the CAIC staff is asking that anyone interested in presenting a talk contact them at caic@qwestoffice.net with "CSAW" in the subject line. Please include a brief outline on the topic you wish to present, an author biography, and your contact information. Past topics have included the use of explosives in grid patterns to increase stability, theories of avalanche flow and the best way to survive if caught, case studies of recent avalanche accidents, and the annual winter forecast presented by the Grand Junction National Weather Service Office. The recent high temps around Colorado are good reason to post some reminders for heat safety. For more information, the National Weather Service has a ton more heat-related safety information posted on their National Weather Service Heat Safety Page. Teach children not to play in, on or around cars. Drink plenty of water or other non-alcohol or caffeinated fluids. Your body needs water to keep cool. Drink plenty of fluids even if you don't feel thirsty. Persons who have epilepsy or heart, kidney, or liver disease, are on fluid restrictive diets or have a problem with fluid retention should consult a physician before increasing their consumption of fluids. Do not drink alcoholic beverages and limited caffeinated beverages. Sponsored by the Colorado State Fire Chief's Association, in cooperation with the Colorado Rockies, come out and enjoy a night at the ballpark while at the same time paying tribute to Colorado's firefighters and raising funds for the Colorado Fallen Firefighters Foundation. The Colorado Fallen Firefighters Foundation provides support and higher education scholarship opportunities to families of Colorado firefighters who died in the line-of-duty. For more information about the Colorado Fallen Firefighters Foundation, go to: http://www.coff.us. For more information and ticket-orders, visit the Colorado Rockies Firefighter Appreciation Facebook Page or the Colorado State Fire Chief's Association Firefighter Appreciation Site. Below is a copy of the Colorado Emergency Management Academy application. Read our earlier post for details on the Academy. Fore more on the CEPC, its mission and the meeting(s), see the June Announcement for the July 2010 CEPC Meeting or contact Jack.Cobb@state.co.us. Pueblo City-County Public Health Department is hosting a Sampling Course, conducted by Louisiana State University (LSU), on July 27-29, 2010. The course is designed for emergency responders and teaches methods to collect potential Weapons of Mass Destruction (WMD) material for testing and sampling. The course is both classroom and hands-on instruction. The class will be held at Pueblo West Fire Station #3 at 729 East Gold Drive, Pueblo West, CO 81007 and there is no cost for the course. Download and complete the LSU Sampling Course Flyer to register and for more information on the course, contact Jim Cody or Loraine Greenwood. Firefighting crews are responding this morning to a wildfire reported last night on Bureau of Land Management lands on the south side of Menefee Mountain about seven miles south of Mancos. Torching was visible last night from private homes in Weber Canyon. As of this morning, the lightning start is estimated at five acres, burning in pinon and juniper trees on steep slopes. Firefighting crews have established a heli-base on private property nearby in the canyon. Helicopters are making water drops, and air tankers will be making retardant drops on the fire this morning. A hotshot crew and initial attack crew have been mobilized onsite. A lightning strike fire reported yesterday on Colorado State lands southwest of Summit Reservoir was contained at a quarter acre by helicopter drops and ground crews. Over the past couple of days, the Durango Interagency Fire Dispatch Center has reported thousands of lightning strikes, and reconnaissance crews are monitoring reports of flame or smoke across the San Juan Public Lands. 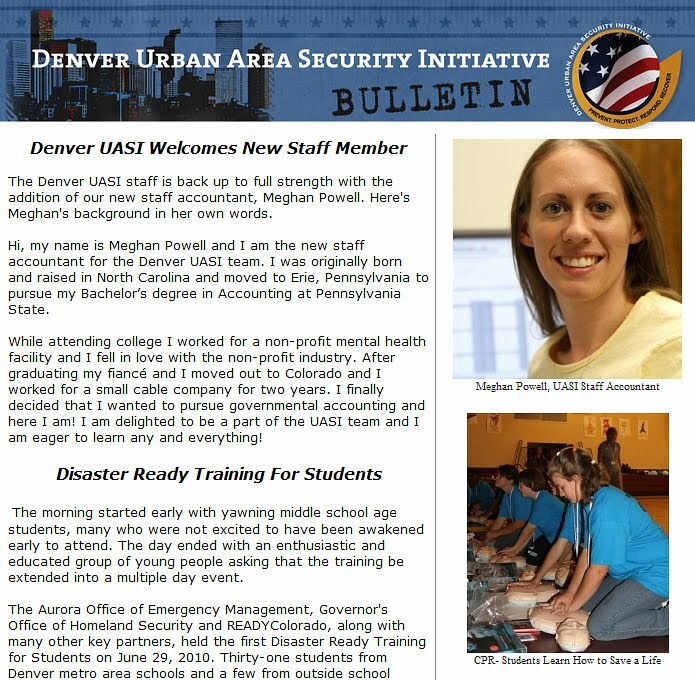 If you live in the Denver Metro area and are not signed up to receive the Denver Urban Area Security Initiative (UASI) Bulletin, you are missing out. It is your source in the area for the latest information regarding public and professional safety/security training opportunities, recaps of safety/security-related trainings and events affecting the front range, and Denver-UASI staff contact information. What is the Denver UASI? It is a multi-partner program hosted by the Denver Emergency Management and Homeland Security Office, one of 60 across the country, to receive grant monies from the Department of Homeland Security Urban Security Initiative program to equip and train first responders and promote community education and resilience against security threats. The most recognized "face" of the Denver-UASI effort is the READYColorado Program, a program which supports outreach, education and materials to enhance citizen preparedness. Our Division is a partner and avid supporter of the READYColorado program and works closely with our Denver-UASI colleagues on a wide range of training and outreach efforts. However, the efforts of Denver-UASI reach far beyond just the READYColorado Program. 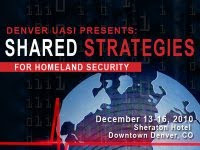 As a provider of preparedness training classes to hosting the first-ever Shared Strategies for Homeland Security Conference here in Denver this coming December, the program's efforts are making a tangible difference in promoting awareness and linking subject-matter experts with those who have a desire to learn and apply their knowledge to make our communities safer (note: interested in learning more about the Conference? Check out the Shared Strategies Conference Facebook page for some cool behind-the-scenes on the what, why and who of this international security conference... going to be very, very interesting!). 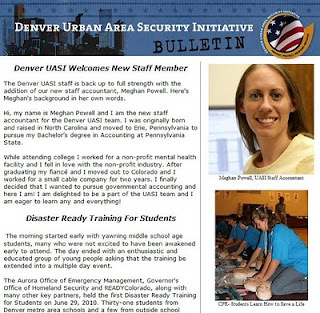 So, in addition to the READYColorado Newsletter, the Denver-UASI also sends around a periodic newsletter, called the Denver-UASI Bulletin to keep you up to speed on the latest initiatives and education opportunities. So go ahead, Sign Up for the Denver-UASI Newsletter and find out what others are doing and what you do in your neighborhood to make it safer!